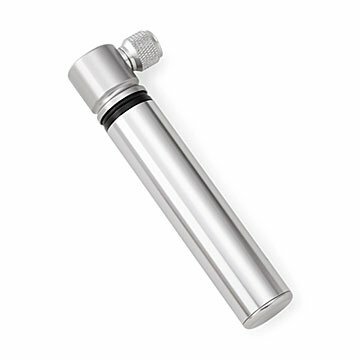 This compact, lightweight bike pump fits in your pocket or pannier bag for roadside assistance. Sometimes, to move forward all you need is a little air. This compact bike pump fits in your pocket or pannier bag, keeping an easy supply of air at hand. Made from a tough but lightweight aluminum alloy and just 4.75 inches long, the pump fits any Presta valve tire and provides 90 PSI for on-the-go emergencies. It's a smart addition to your road kit that won't weigh you down. Made in China. Pumps up to 90 psi / 620 kPa. It would have been great, but I am not a biker and so had no idea about different valve types; this pump is only for a particular valve (presta), and it's not the type my husband's bike had. So, make sure you have the right vavle! Bike pump fits neatly into book bag! Santa will put this in the stocking!